This disabling movement disorder affects the person’s professional task, whether be it a writing - as seen here, or playing music……… this too can be cured!! The initial complain involve loss of precision muscle coordination, cramping, and aching of the hand with task-specific movements. The hand assumes a semi flexed position of the fingers with possible hyperextension of the fingers and hyper flexion or extension of the wrist with supination or pronation. The symptoms increase on attempting to do a specific task, such as writing. In some cases, the hand may dart across the page with a sudden jerk. A related condition is primary writing tremor. Affected individuals manifest a high-amplitude tremor only with writing. Although clinical manifestations in FHD are typically unilateral in the beginning, the disorder is considered as a bilateral dysfunction of the basal ganglia. This is demonstrated by the fact that up to 25% of patients develop bilateral FHD if they switch to the previously unaffected hand. Neurological examination is usually normal. Subtle findings comprise mild dystonic postures developing either impulsively or with movement and reduced arm swing. 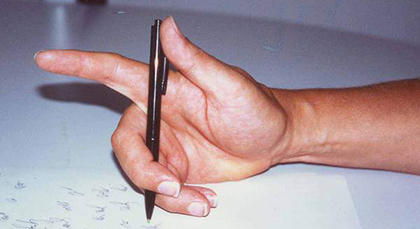 One third of patients have a tremor in the affected hand when the extremity is outstretched or while writing. Observation of the limb all through writing is an important part of the examination; the supposition of dystonic postures should be demonstrable. Patients having tremors with primarily writing, a variant of writer’s cramp may manifest a large amplitude tremor only during writing. Contrast to crucial tremor, sustentation or action tremors are not seen with other chores such as holding a full cup of liquid or coordination testing. Dystonic posture is usually not seen with this condition. One of the most important features that distinguish writer’s dystonia from other dystonia is the absence of dystonia during other activities involving hand and no evidence of dystonia in any other part of the body.